Who says, "You can't take it with you?" Now you can take the profit machine with you on the road for practically any grilling event. 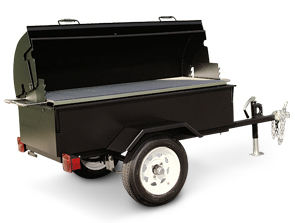 ►Need a PORTA-GRILL® MOBILE-M Fast? The patented features of the MOBILE-M will bring you amazing results. The 1" air space between the 3/16" thick steel liner and the firebox walls provide a uniform draft under the fire grate. This creates uniform heat and an even grill temperature from end to end. Designed to take extreme heat. The MOBILE-M will burn standard charcoal, mesquite or other aromatic wood chips, which adds a unique flavor to your meat. While ordinary charcoal burns at 700°, mesquite burns with a temperature of up to 1500°. The heavy-duty liner and fire grate protect the firebox from the extreme heat.